Rear-facing car seats aren’t more dangerous for kids compared with front-facing seats. 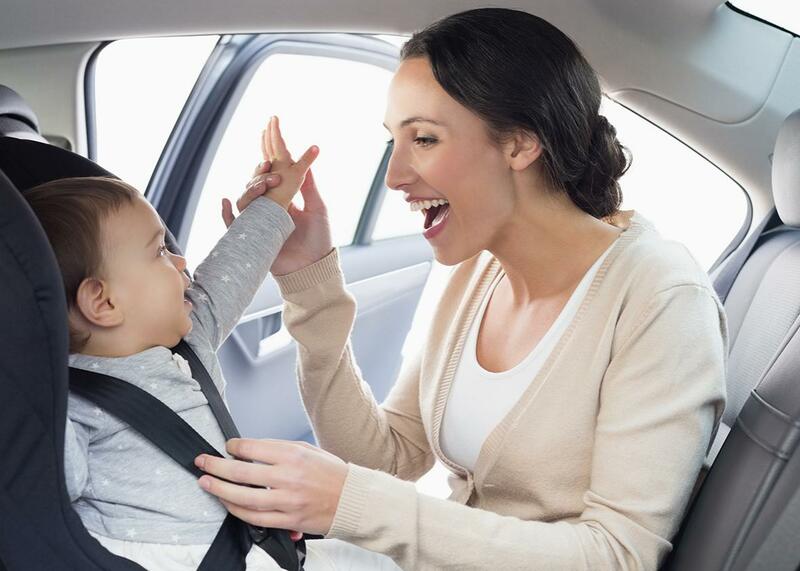 Ignore the latest study on car-seat safety. There’s no serious danger to kids in rear-facing seats. Safe and sound in a read-facing car seat. Of course car seats save kids’ lives, but they also drive parents nuts. And just when you thought carting your kids around couldn’t get any more complicated, a new study covered by the Washington Post raises questions about the safety of what has always been heralded as best of the best of child thrones: the rear-facing car seat. But you can ignore those questions. Rear-facing car seats are still the absolute safest way for kids to ride, so if your child uses one, do nothing except pat yourself on the back (and maybe check that you installed it correctly). The new research not only has serious limitations, but it is also irrelevant in most serious crashes. In the study, which was published in Traffic Injury Prevention, researchers at Robson Forensic, a Pennsylvania company that provides “investigations, reports, and testimony” for legal cases and insurance claims (including those involving car crashes), put dummy models of 6-month-old infants in three types of rear-facing car seats. They secured the car seats either with the Lower Anchors and Tethers for Children, or LATCH, system or seat belts in the back seat of a 2012 Toyota Camry and put them to the test in 36 crashes that simulated being hit from behind at 30 miles per hour. They found that for 2 out of 3 seats they tested, the dummies’ heads were more likely to strike the back seats in these crashes and to hit them harder when the seats were restrained using LATCH. But here’s the thing: 30 mph rear-end crashes are rare. Most rear-end crashes happen at much lower speeds, because the person who hits you from behind is typically slamming on their brakes. The nonprofit Insurance Institute for Highway Safety conducts all of its rear-end crash tests at 20 mph, not 30. The National Highway Traffic Safety Administration doesn’t even conduct rear-impact crash tests, and car seats sold in the U.S. are not required to meet any requirements in rear-end crashes, in part because they are not a very common cause of child injury. As the Washington Post article explains, rear-end crashes account for a mere 9 percent of injuries to kids in car seats, while a whopping 85 percent of children who die in car crashes before their first birthdays are victims of frontal or side-impact collisions—the very collisions in which rear-facing car seats are lifesavers. The study’s criteria for what constitutes an injurious blow to the head may be a little overzealous, too. The worst head injuries they got in their crash tests—which was when the Graco SnugRide was secured using LATCH—corresponded to a “Head Injury Criterion” value of 347.3 on average, which is less than the National Highway Traffic Safety Administration’s recommended limit of 390 for a 1-year-old. (The other car seats got much lower injury values.) And the recommended limit is also extremely conservative, as it corresponds to just a 5-percent risk of severe injury. In other words, the little dummies who fared the worst in this study didn’t actually hit their heads that hard. Then there’s the question of how reliable the data from the study are. The Graco SnugRide, which again performed the worst, was crash-tested using LATCH a total of four times, which is not exactly a lot. One of those four times, the researchers discovered during the test that they hadn’t set things up right, so they tossed the results. The other three crash tests they did with the Graco—though supposedly identical in every way—resulted in rather variable head injuries, which suggests that there are “unanswered questions about the testing methods and the repeatability of the test,” according to a blog post by Dr. Alisa Baer, “the car seat lady,” a Manhattan-based pediatrician who is also a nationally certified child passengersafety instructor. Baer adds that the study also doesn’t account for the various ways in which rear-facing car seats can be stopped from flipping up toward the rear of the car and causing injuries. Many parents keep the handle of a rear-facing seat angled forward in the “carry” position in the car, which serves as an excellent barrier between a child’s head and the back of the seat. Other rear-facing seats, such as the Clek Foonf and the Clek Fllo, have metal devices that prevent rebounding. And some rear-facing seats even have tethers. These seats weren’t included in Robson’s tests or mentioned in the study, but in the event of a high-speed rear-end crash, they would likely prevent a kid’s head from getting smacked. The point here is that rear-facing seats are still by far the best protection for kids under 2 in the most common and dangerous types of car crashes. Citing this new study as evidence that parents shouldn’t be using rear-facing seats is like arguing that parents shouldn’t use household smoke alarms because there’s a chance one could fall from the ceiling some day and hit your kid on the head. You might be tempted to conclude, based on these findings, that it’s best to secure your kid’s rear-facing seat using a seat belt instead of LATCH, but even that conclusion might not be warranted, because there’s no way to know whether the findings actually apply to your car, your car seat, or the crash you might one day experience. Basically: We need more and better data to determine what installation tweaks, if any, might be needed for rear-facing seats. It’s far better for you to spend 10 minutes double-checking that your kid’s car seat is installed correctly than it is to read any scare stories about this study.